In previous installment of the Destiny, there is no matchmaking for high level content such as Raids or Nightfall Strikes. If you want to master these activities, you have to find yourself a team. Either you have enough friends who are online, or you can search the social networks for possible team members. However, many players avoid such LFG pages. Therefore, numerous Guardians have never completed a raid in Destiny 1. According to Bungie, only 50% of the gamers have tried the endgame content at all. In Destiny 2, it is easier for the solo players to find a team for such activities. Everyone should have the chance to play all the activities in Destiny 2. The solution is called: Guided Games. According to Project-Lead Mark Noseworthy, each player can decide for himself whether he wants to play solo or in the Destiny 2 clan. Solo is great, but the best moments in the group are when you face challenges together. Guided games are linked to matchmaking and community building for endgame activities such as raids, trials, and nightfall strikes. This makes it possible for one or two players to find a group that needs one or two players for their activity. The searcher, the solo player, gets some clan suggestions. He sees the banner and the motto of the clan and thus gets a first impression as to whether the members of the clan could fit into one. If the clan does not suit you, you can, just like Tinder, simply wipe and the next clan will be displayed to one. For example, "Oh, these guys speak my language, great!" You could choose this clan. On the other hand, in a normal matchmaking, you are wildly spoiled with other players. Guided games have a selection and avoids this - which is at least the idea - toxicity. Guided games don’t involve any obligations. You can play the raid together and then go separate ways. However, Bungie hopes that the solo players will find new friends and join the clan. The sense of community is written with Destiny 2. - If you are looking for a clan you can see not only his name, but also his motto and his banner. So you get a first impression of what people are in this clan. A matchmaking feature for all endgame content has been required by parts of the community for a long time. 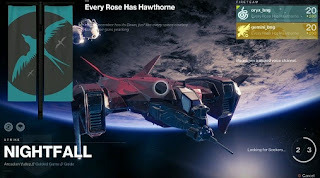 However, Bungie argued that the philosophy of the most difficult challenges in Destiny is that the players communicate with their voice and teamwork stands above all. Public matchmaking would contradict this idea. Guided games should now allow the solo players to play not only the activities but also in the best possible way. A normal matchmaking is the simplest solution, but the guided games would be more like Bungie's idea. You want to deliver what the community wants. But sometimes it comes in a somewhat different form, said executive producer David Allen. In short, the guided games are matchmaking in Bungie style.